What better place to ask that special person to share a life together! Your adventure begins as you depart SKY Hangar (or the Vancouver Harbour Heliport) heading toward the Coast Mountains. Fly over the peaks to see waterfalls, alpine lakes, and untouched nature. Your flight includes a remote backcountry landing, where you depart the helicopter to stroll the mountain peek or shore of a secluded alpine lake. 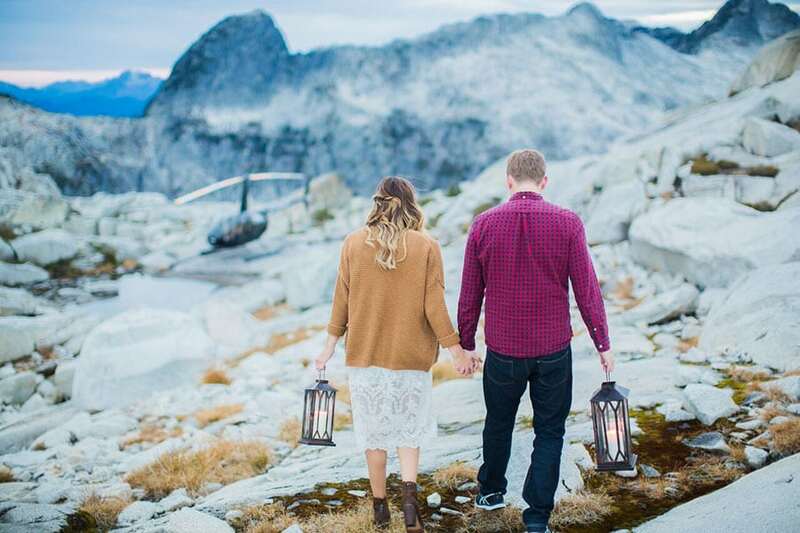 Upon returning to the helicopter, your pilot will have a celebratory bottle of champagne ready for you to toast your engagement before returning to SKY Hangar. When reserving, please request “Backcountry Proposal Package” and which departure package you are interested in the message. Gratuity not included. SKY Helicopters reserves the right to cancel any booking on or before the date of the booking at their discretion for any reason, including but not limited to, poor weather, maintenance requirements, and lack of aircraft availability. 15-minute backcountry landing on the mountaintop (weather permitting), the shore of an alpine lake or glacier-fed river. Plan an unforgettable experience. Choose the adventure you want and explore BC like you’ve never seen it before.